Newcastle passenger and car ferry ticket prices, timetables, ticket reservations and information for ferries sailing from Newcastle to Amsterdam (Ijmuiden). Compare all available Newcastle ferry ticket prices in real time and book the cheapest available Newcastle car and passenger ferry tickets sailing to and from Newcastle, Amsterdam (Ijmuiden) with DFDS Seaways Ferries ferries online with instant confirmation. Book Newcastle Ferry Tickets with DFDS Seaways Ferries for ferries sailing from Newcastle to Amsterdam (Ijmuiden) online in advance to enjoy the cheapest available ferry ticket price. The price you see is the price you pay. There are no hidden extras or surprises such as added fuel surcharges or booking fees and we do not charge you anything extra for paying with a Visa Electron card. The price we quote you for your selected Newcastle passenger or car ferry ticket, onboard accommodation and vehicle type is all you will pay, and that's a promise. To obtain a Newcastle ferry ticket price and book your ferry ticket securely online please use the real time ferry booking form on the left. You are also able to add a hotel at your destination, or anywhere else, to your ferry ticket when completing your ferry ticket reservation. 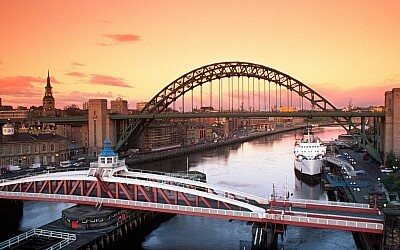 Newcastle upon Tyne is a port city in the North East of England. It has a population of 250,000 but including the surrounding urban area its population is almost 1 million. It has arguably the best nightlife in all of Britain, and has a distinct Geordie vernacular. DFDS Seaways Ferries has a daily ferry from Newcastle to Amsterdam in Holland. Special buses run from the Central Station to the ferry terminal. Way cheaper are public buses leaving from the shopping mall next door or the metro. From the Port of Newcastle it is possible to sail to many North Sea destinations. These include cities in Holland, Denmark, Germany, Norway and Sweden. The ferries are run by DFDS Seaways and Fjordline. In its thousand years of history Newcastle (properly known as Newcastle-upon-Tyne) has grown from a defensive fort on Hadrian's wall, to one of the most influential cities in industry. Today, Newcastle has become a world leader in culture. Recently Newcastle has had one of the fastest growing tourist industries in the world. It is for this reason that we have created this site, to help anyone planning a trip to Newcastle to have the best time possible. The opportunities for having a great night out in Newcastle are arguably the best in the country so for those interested in Newcastle for its famed nightlife, we have comprehensive listings of all the entertainment attractions Newcastle has to offer. Newcastle has an excellent selection of pubs and clubs in which to spend time and have fun. The Geordie hospitality is unmatched and with Newcastle's large student population the pubs and clubs are of excellent quality to ensure a fun night out for all. If it's Newcastle's history and heritage that you are most interested in, then we have exactly what you need, whether you want to explore the city's history, visit one of the many historic castles in the surrounding area, or plan on visiting any of the numerous museums dedicated to one of the many industries that Newcastle fostered. All the Newcastle tourist information you require to plan your perfect Newcastle trip is here on this site. No matter what reason you come to Newcastle, if it's to explore the past or the pubs, you will need somewhere to stay. We aim to provide as much up to date tourist information as possible to ensure that you can make the right choice when it comes to picking your accommodation. We also have listings of all the excellent pubs and clubs in Newcastle so you can find out what's nearby and plan your evening accordingly. Our links section also contains a selection of websites related to Newcastle's history allowing everyone to plan their ideal Newcastle holiday. Of course, it's all very well telling you about all the excellent places to visit and things to do, but it's not much good if you can't get there. So, to help, we have included a travel section. This gives you details of both travel options to get to Newcastle itself, and also contains helpful advice concerning the best ways to get about within Newcastle. We also have a Newcastle Maps section, we have links to many excellent resources that will enable you to find any of the restaurants, pubs, clubs, or other attractions that we've recommended. Best Price Guarantee - We always offer you our lowest available DFDS Seaways, Stena Line or P&O passenger and car ferries ticket price to and from Newcastle. There are no hidden extras or surprises such as added fuel surcharges or booking fees and we also we do not charge you anything extra for paying with a Visa Electron card. The price we quote for your selected Newcastle ferry ticket, onboard accommodation and vehicle type is all you will pay, and that's a promise! In the unlikely event you find the same all inclusive Newcastle ferry ticket cheaper in the brochure of any other tour operator we promise that we will do our best to beat that price or offer you the choice of requesting a refund. To book Newcastle car and passenger ferry tickets please click here. At FerryTO you are able to obtain live Newcastle ferry ticket prices, check availability and book car and passenger ferry tickets to and from Newcastle at our lowest available ticket price. Ferryto.co.uk is part of the world's largest online ferry ticket distribution network providing the ability to book over 80 major European ferry operators including to Newcastle and to over 1,200 other ferry routes throughout the UK, France, Spain, Ireland, Holland, Eastern Europe, the Mediterranean, the Baltic and North Africa.